Have you had your ceilings painted in Shenandoah within the past 10 years? Have you ever had them painted? If not, you are in for real a treat! 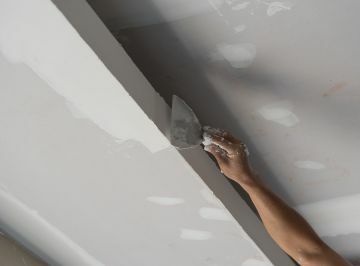 If you are searching for a painting contractor to paint Shenandoah ceilings, whether they have simply dulled over time, or became stained from a roof leak or a smoker, Palmer Pro can help. You will be amazed at the difference fresh coat of paint can make! Let Palmer Pro make your ceilings white and bright again. You'll be glad you did! Got Ceiling Stains in Shenandoah? Whether you have a smoker in the family or a roof leak has discolored your ceiling, the results can become unsightly. Ceiling stains don't generally happen quickly, but they sneak up over time. Eventually, your ceilings can detract from your otherwise lovely home. Palmer Pro can cover those stains with a tough primer and let it fully dry before applying a couple coats of fresh paint. The result is a white again, bright again ceiling that will return the focus your interior decor. Since 2015, Palmer Pro has been painting houses in Shenandoah Texas. Ceiling painting is one of the many painting services we provide. We take pride in providing quality painting services at competitive rates. When you call (832) 410-1868 for a quote to paint your ceilings in Shenandoah, you'll be treated as the valued customer that you are! We treat each of our customers as if our relationship depends on your happiness - because we know that it does!